Atomic Testing Museum 755 E. Flamingo Rd. Please register NO LATER THAN MARCH 1, 2008. THERE WILL BE NO ONSITE REGISTRATION. If you want to attend the Cirque Du Soleil show, please let me know no later than 5:00 p.m., February 11th as I have to make the reservations a month in advance. 8:30-9:30 a.m. Business meeting, Stan Fulton Bldg. Departing Las Vegas 8 a.m.
Instruction, motorcoach transportation, Death Valley park entrance fees, water, light snacks, and box lunch. There is no conference hotel. Here is a list of hotels and motels reasonably near the university that still have rooms available now (Dec. 2007) and have rooms for less than $200 (although not necessarily rooms with two beds for less than $200). Extended Stay Hotels is committed to ensuring a clean room at a reasonable price. Services are scheduled based on the number of nights reserved, i.e. 1-6 Nights – Towel exchange is available at the Front Desk; 7+ Nights – One Full Service provided each 7 days. Full Service (provided each 7 days) includes dusting, vacuuming, changing linens and towels, emptying trash, cleaning of bathroom and kitchen, and replenishing soap and toilet paper if needed. * Additional Full Service can be purchased at $10 per service. Refresh Service (optional service) includes replacing soiled towels, emptying trash, replenishing soap and toilet paper if needed, and making bed with existing linens. * Refresh Service may be purchased at $5 per service. There are other casinos and hotels to stay at. Here are some general Las Vegas websites where you can go for information. Package deals with air fare, hotel, and maybe rental cars may be available. A variety of shuttle/limousine services are available at McCarran, and are located on the west side of the baggage claim, outside door exits 8-13. Please note that there are both group shuttle and "for-hire" stretch limousine services. Prices for a non-strip hotel range from $6-12 one way. Prices for a Strip hotel range from $5-6 one way. There is no Super Shuttle here. Taxis are available on the east side of baggage claim, outside door exits 1-5. They do not accept credit cards. There is a fee of $1.20 added to all fares originating at the airport. Fares start with $3.30 on the meter, and $2.20 is then added for every additional mile. There is a Citizens Area Transit (CAT) bus route that stops at the airport and goes along Maryland Parkway, which is the street UNLV is on. The fare is $1.25. Buses require exact change. The fare for the double-decker buses called The Deuce that run on certain routes is $2.00. An all-day pass is $5.00. There is a Rent-A-Car center for the airport. Shuttles depart for it every five minutes. Exit through door 10 or 11. There are buses, trolley buses, and the monorail. Springs Preserve. This is new, and it has a desert garden and a series of museum galleries. Bellagio sights. Bellagio Conservatory. The flowers are changed five times a year. The Dale Chihuly glass ceiling is also in this casino. There are also fountains outside that dance to music. Liberace Museum. 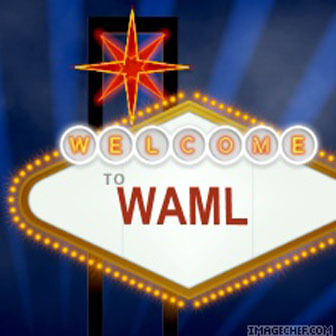 This museum has been renovated since WAML met in Las Vegas in 1995. The museum even has shuttle service. Clark County Heritage Museum. Museum is very inexpensive and includes historic building and permanent and changing exhibits on the history of this area. Bibliographic & Metadata Services Dept.